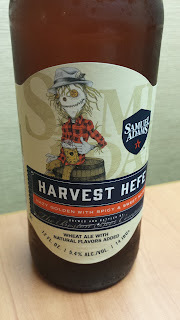 This week's Sunday Night Suds looks at Samuel Adams Harvest Hefe. Although this beer is part of the newest fall seasonal mix box from Samuel Adams, I found it in the mix your own six refrigerated section of the Albany Colonie Price Chopper. [Ed note--an anonymous commenter tipped me that it was not part of the variety pack. After I found it in the mix your six I checked the Sam Adams website and it clicked through the seasonal variety pack link, but its not part of the variety pack. Post a comment if you find it in sixers]. This beer is not your average hefeweizen. It starts with the phenols and then adds some levels of complexity with cinnamon and nutmeg. I'm sure that I must have had cinnamon spiced beer before, but this beer is unusual as it tastes like the offspring of a box of redhots and cloves. The beer has a lower level of alcohol (5.4% abv) and could probably be used as a session brew. It worked well with chicken marsala and would probably match with other mild chicken dishes. The Samuel Adams Harvest Hefe is under the Kosher Supervision of the Star-K and has a Star-K certification mark on the bottle. To see what the experts on Beer Advocate think about this brew, please follow this link - beeradvocate.com/beer/profile/35/294588. (Keep in mind, this beer is so new, there are virtually no reviews as of today). You are correct. The Sam Adams website has it as a click through under the Seasonal Variety Pack on their main page, but it is not actually appear in the pack. Thanks for the tip.